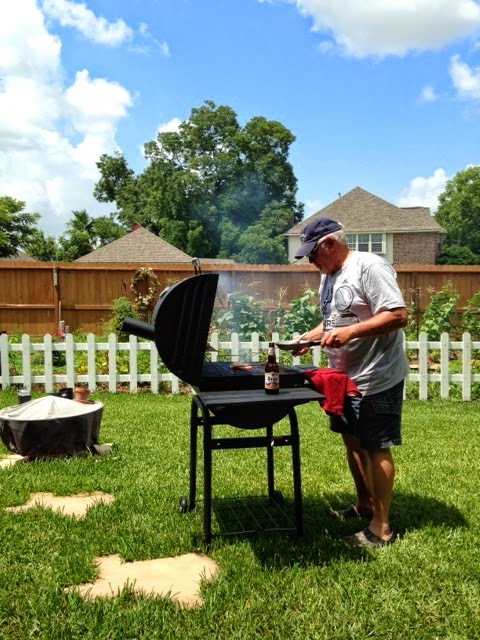 This Father's Day I broke in a new wood grill (courtesy of wifey), wore a gift tee-shirt (San Antonio Spurs 2014 Western Conference Champions, courtesy of wifey) and Harvard cap (courtesy of daughter), drank my customary Shiner Bock, opened a fine bottle of wine (courtesy of another daughter), watered a new house plant (courtesy of yet another daughter), communicated with all my children, and reflected. Writing is like being a parent -- you help give the manuscript birth, worry about it, help it grow, overprotect it, sometimes go days or weeks without sitting down and having a long talk with it, nourish it. The manuscript is like a child. It is never far from your mind. You want it to be the best it can be. And you realize that you aren't in this wonderful calling of authorship alone. Others help with things they say; ideas you can use to improve the manuscript. Readers asked to review it give you further insight. Muses come to your aid as do memories. Unlike human fatherhood, there comes a time when you are done with the manuscript. If lucky, an agent and an editor will be interested enough to help the manuscript grow further than you, the father, alone can take it. Now is that time for me. After four serious edits my novel, Sinner-Saint: The Redemption of Euel Leevy, is done. Time now to let it go.